Nottinghamshire history > An address to the young folks of Stapleford, 1906. You are in: Home > Places > Robert Mellors, An address to the young folks of Stapleford, 1906. WHEN the Head Teacher of the Council Schools for Boys (Mr. Spencer) informed me that he had an annual custom of sending a Christmas letter to the old and present boys of his School, and he asked me to write this year's letter, I felt that I must comply, not only because I considered the idea an excellent one, worthy of being carried out, but I thought the reason why he had wished me to write was, that fifty years ago I often used to talk to the Stapleford boys and girls, whom I suppose you now call your fathers or grandfathers, and mothers or grandmothers. I have also treasured the friendship of many persons I then knew in Stapleford. I will name three only:—Joseph Fearfield, who had always a smile and an apple, and both were good; John Harrison, who had music in his soul; and Thomas Dalley, who went about doing good. My letter shall be of the things that are or have been around you, and of events that occurred in Stapleford ; that these may help you to proceed from the known to the unknown, to learn from the past lessons for your future guidance. Where shall we begin? I like those four words in Genesis, "In the beginning God "—for with God on the scene all objects, including matter, life, conscience, follow naturally. We will not, however, go so far back as that. We will begin with the ground that is under your feet. In "The Geology of Stapleford and Sandiacre" Mr. J. Shipman says:—" I know of no similar area where so much work for the field geologist is crowded into such a small space." He shows how the rocks have been shattered and displaced by faults, and pushed up or let down, "as to remind one of a patchwork quilt or Mosaic pavement." He then refers to the millstone grit on Stony Clouds, to the Bunter pebble beds, the Waterstones, the Coal measures, the glacial drift deposits, the alluvial deposits of the Erewash, etc., all of which I am not competent to discuss, but I suggest you should form classes for the study of them. 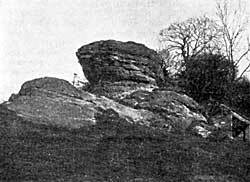 As evidence of the glacial period, he gives a picture of the boulder clay, much Contorted, resting on crumpled-up upper keuper shales, at Wilsthorpe Brickyard, Sandiacre, in 1883. He says that "both parishes are just on the southern edge of the great Nottinghamshire, Derbyshire, and Yorkshire coalfields. North of a line drawn east and west through the north side of these villages stretch the coal measures and lower carboniferous rocks, which have been forced up into a great saddle-back, or anti-clinical ridge, now known as the Pennine Chain. South of this east and west line the new Red Sandstone strata have been faulted down two or three hundred feet." He speaks of a deposit of drift close to Bob's Rock resting "against an old cliff of Bunter Sandstone much fissured and weathered, which formed a sheltered nook in which the sand was deposited when the country was submerged during one of the stages of the glacial period." How shall we Read that Stone Book?—Let us shut our eyes and try to imagine that in vast ages ago the climate here, over what is now called Stapleford, was hot and moist; the land being partly in the water and partly out; the vegetation rich with gigantic ferns (such as flourish in Ceylon), and peat mosses grown in vast swamps, and then the vegetation having been covered up and gasses generated, having formed what we now call coal; and this process having gone on with alternate deposits of shale, clay, and sand; then another coal bed, and another, until there are in the Nottinghamshire coal bearing measures two thousand feet of strata, covering nine coal beds. The land sank, the sea covered it with hundreds of feet of water, so that what is now called Stapleford must have been at the bottom of the sea. Ages passed as newer beds of rock were laid down in the centre and to the east of the county, and in Lincolnshire. The scene changes, for a mighty upheaval lifts up the Derbyshire hills (called the Pennine Eange) to vast heights, much of which material has since been washed away; the result of that upheaval being that the coal beds on the eastern side of the Pennine Range, including Stapleford, dip to the east, while on the Lancashire side the dip is to the west. The condition changes as ages pass, and the atmosphere becomes as cold as Greenland now is; millions of tons of ice cover the land. Again ages pass, the cold gradually relaxes, forests appear, and from the great ice packs covering the Derbyshire hills, and the hills of Kirkby, at the head of the Erewash Valley, the water washes and carries away some of the land, and forms channels, such as the Erewash Valley, in rushing down to the greater valley of the Trent, and some of the coal deposits are washed away, so that one of the coal seams now appears in Stapleford at the surface. Let us now in thought take a leap of say 25,000 years—the period suggested by Professor Kendall since the departure of the ice from Yorkshire—(a) several thousand years more or less will make little difference—the hills of Stapleford have been reduced by air, frost, rain, and the usual wear, and the Erewash Valley has been raised by the deposit washed from the hills. The action of the sun and rain on the surface, the work of worms, and of decayed vegetation, have converted the sand and clay into soil. The woolly rhinoceros, reindeer, lion, hyena, hippopotamus, mammoth, etc , the bones of which have been found in Cresswell Caves, show that these animals formerly haunted the district, and have long disappeared; (b)the well-known habits of these animals tell us of the great extremes of heat and cold through which the country passed in succeeding ages. 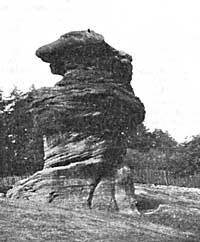 The Hemlock Stone.—When the turbulent waters subsided they left that remarkable object called the Hemlock Stone (possibly formerly Cromlech Stone'), said to be 30 feet in height, and in girth about 70 feet. Protected possibly by sand, and being capped by a wonderful cement of its own, called barium sulphate, it defies the action of frost, rain, sun and wind. It may in a distant age have been a gathering point for worship, and it now stands in one of the beauty spots of the county, for "there is no spot round Nottingham more picturesque on a bright summer's day than the Hemlock Stone and its surroundings." " That stone is an object of wonder and mystery to the passer-by; "(c) but it is not so great a wonder as of the common things of life. Where do we all come from? Where are we all going to? What is life? Why is pain? How does a shoot grow from a seed? A chicken from an egg? A butterfly from a chrysalis ? The Name.—Was the name of Stapleford taken from the ford to the market? The Anglo-Saxon word "staple" or "stapul" means a step or post, and then a market for raw materials and goods. 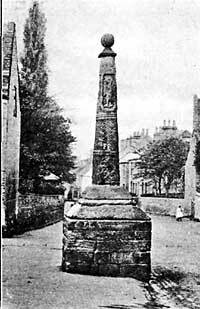 Is it possible that the "stapul " or "post" was the old pillar or cross, and that it gave its name to the parish? In "Domesday Book" the word was spelt as now, but in Speed's map of 1610 it appears as "Stappleford;" and Sandiacre as St. Iaker, and the same appears in Bleau's Amsterdam map of 1648. In the opposite end of the county, at a point where met the boundaries of three counties, there is an old landmark called ''God's Cross." May this pillar have been the God's Cross between two counties? It is very unlikely, but it is not improbable that there may be some connection in the name between the "post" and the "ford." It must be borne in mind that the cap and the base of the cross are modern. Early History.—The Romans who departed from England are said to have had a station in Stapleford. They probably frequently passed on the road between Nottingham and Derby. The Engles or Saxons came to England in 449, and afterwards settled in Stapleford and neighbourhood. They were doubtless greatly harassed by the Danes, who had two of their strongholds in Nottingham and Derby, and who at intervals over one hundred and fifty years made frequent raids, so that a tax had to be paid by the Anglo-Saxons, called the Danegeld, on purpose to keep the Danes off, but the tax kept on, even when the Danes were gone. Then came that great invasion called the "The Norman Conquest." Nottingham Castle and all the surrounding district was subdued, and William the Conqueror ordered an account to be taken of the state of affairs in every parish in England. Twenty years after the Conquest this account was completed and published. It is called "Domesday Book." Let us now see what it says of Stapleford. "IIII Manors. In Stapleford, Ulsi Cilt, and Staplewin and Goodwin and Gladwin had 2 carcuates of land and 6 bovates to be taxed. There is land to 8 ploughs. William has in the demense there (Robert holds of him) 3 ploughs and 6 villeins with 6 ploughs and two bondmen. There is a priest and a church and 58 acres of meadow. Value in King Edward's time 60/-, now 40/-." Now, although the foregoing is a translation, it must be further translated. In King Edward's time each of the four persons named had their own houses and estates in Stapleford. Two carucates would probably be 240 acres, and six bovates, probably fifteen acres each (for the terms here used are variable or uncertain)—say 90 acres, so 380 acres assessed; but there was land for three ploughs, query 360 acres of arable land. Stapleford was now a manor belonging to William de Peverel. The former owners were probably killed off in battle. Now Robert de Heriz, a Norman soldier, holds the land and houses, subject to some fixed fee or tax, and to service to be rendered to the king, and to his overlord, in the wars whenever required. Robert has three ploughs, uncertain areas, and he has six villeins, small farmers, who occupied a portion of land, possibly thirty acres each in half-acre strips, belonging to Robert, and they have to do his work on one or two days a week in removing his manure, ploughing his land (and finding two oxen for that purpose), sowing his seed, reaping his corn, etc. They cannot go away, they must live and die here, although they have six ploughs. The two bondmen are worse off still. They are serfs, and are sold like cattle; they are cowherds, or swineherds, etc. The demesne is the domain or enclosure which was round the Manor House, and up to and including the Church. It enclosed the garaens, houses, fields and farm buildings of the lord of the manor. The fifty-eight acres of meadow would be grass land probably near the river, and would be enclosed, while the plough land would be in three open fields in narrow strips. Then there would be the Moor and the woodland unenclosed. The priest would be subject to the Archbishop of York, and hold a portion of land. The "ploughs" of occupation are not implements, but holdings of areas much less in size than the "ploughs" for assessment. The Church would most likely be built of timber and wattle, and be thatched with straw or with reeds. The value for taxing purposes had gone down one-third in twenty years by reason of the Conquest. Here I want you to notice how the character of a word may, like the character of a man, degenerate. That word "villein" meant a person of poor social condition; now it means an infamous scoundrel. William de Peverel, the overlord of Stapleford, was the son of William the Conqueror, was appointed Governor of Nottingham Castle and of Sherwood Forest, and he was lord of 162 manors in England and many houses and lands, a large portion of his domain being in Derbyshire, hence Sir Walter Scott's "Peveril of the Peak." He or his father founded the Court called "The Honour of Peverel," with jurisdiction in 127 villages in Nottinghamshire and 120 in Derbyshire, which continued to a limited extent down to our own day. Between 1103 and 1108 he founded the Priory of Lenton in honour of the Holy Trinity, and for the love of divine worship and the common remedy of the souls of his lord, King William, and others, including his own soul and those of his wife and children; and he endowed the Priory with very extensive possessions, for a list of which see the "Parish and Priory of Lenton," by J. T Godfrey. Geoffrey de Heriz gave two parts of the tithes in his demesne in Stapleford, and Robert de Heriz was one of the witnesses to the charter. William de Peveril died in 1113. Thoroton says that Richard de Cazmera married Lady Avicia of Stapleford, who gave that church to Newstead Priory. Phillip de Stadley (a.d. 1200) gave the King ten marks and a palfrey for having the daughter of Avicia de Stapleford to wife with her inheritance! Let us hope that Phillip made a very good bargain, and that love came in somewhere. Robert Matley had a daughter and heir called Margaret, the wife of John Davenport, Esq., whom the jury in 1454 found to be but seventeen years of age. A foolish girl marrying at that age. What is the lesson intended to be taught to us by the erection of a cross in a public place? I think it is this:—" The Lord Jesus Christ died upon the Cross in obedience to the will of His Father. He thereby made an atonement for the sin of the world, and opened the Kingdom of Heaven and all good to all believers By His blood there shed we have access to God, and obtain pardon, purity and peace. He loved us and gave Himself for us." A cross has another message, a personal one, and it says:—"You have been redeemed. Now you are not your own. Be an imitator of Him who went about doing good, and who left the commandment, "Love one another, as I have loved you." Crosses.—Paulinus, who was one of the priests sent by Pope Gregory to help Augustine in the work of converting the Saxons, and who came to England in 601, 1,800 years ago, became Archbishop of York, and came into Nottinghamshire and erected crosses. When St. Wilfrid, who was Archbishop of York at the beginning of the 8th century, travelled about his diocese, a large body of monks and workmen attended him, and amongst these were the cutters in stone, who made and erected the crosses on the spots which St. Wilfrid consecrated to the worship of God. The Patron Saint. *—The Church is dedicated to St. Helen. It must have been originally dedicated to St. Luke, for the cross is probably many years older than the Church and the anniversary of the dedication of the Church, which is called "the Feast," or "the Wakes," is regulated by St. Luke's Day. How and why the honour was taken from St. Luke and given to St. Helen I do not know, but I do know that Englishmen dearly love to honour a good woman, especially a good queen. Queen Victoria is the patron saint of many a railway station, park, bridge, and monument. It is nearly 1,600 years since Helena died, and fact and fiction are so closely interwoven with regard to her and her son that it is impossible to separate them. So I cannot tell you whether she was the beautiful Helen of York, or of Deira, or the daughter of an innkeeper in Bithynia, or the daughter of King Coilus of Colchester, the original of " Old King Cole, a merry old soul," a lady of unrivalled beauty, but there is little doubt that when she was married her husband was an officer in the Roman army, that she had to bear a grea.t wrong, and that when her son Constantine became Emperor, he, like a good son, did full justice to his mother, who was raised to Imperial dignity, and made Empress. She was distinguished for her virtues of piety and alms-deeds. She went in and out among the common people relieving distress, was a great help to her son, and when eighty years of age went on his behalf to Jerusalem to superintend the erection of a church on Mount Calvary, and there is said to have discovered the true Cross. In the National Gallery, in London, there is a fine painting by Paolo Veronese of the Vision of St. Helena, in which she appears as a beautiful young woman wrapped in repose, but not of sleep, with two beautiful child-angels above bearing the Cross. That vision of the Cross changed her life. The Nottingham city arms are thought to be based on the legend.